I am glad you are stopping in today to visit me at the Caruso Manner. It’s nice to be back home on my old blog, this is home! Unfortunately we are still in the process the site so ignore the DT Senior Designer Widget I will have a reno shortly. For the next few days until August 31 I will be posting some beautiful cards that have been made by a variety of people and over a period of time. 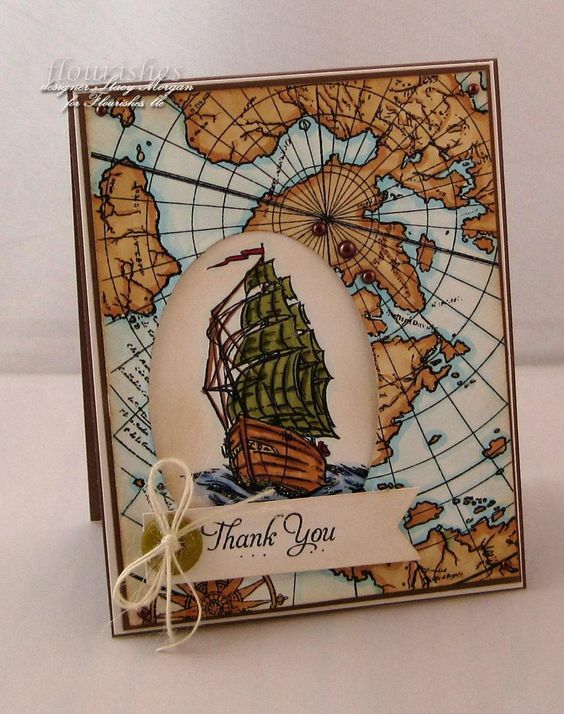 I will only be sharing stamps sets that are still available Flourishes. The store will close tempoarily beginning 9:00AM EST 1 Sept and reopen as soon as all sets made prior to June 1 of this year have been removed. So on to our viewing. Well that all for tonight. Thanks for stoppin in. Today I have some exciting new to share with you. My blog is moving! Yes, after years of writing under a pseudonym of ” The Caruso Manner” I will close this door and move to a new site that Identifies with Flourishes directly– the company I have been growing for the last five years. On Tuesday July 10th I will open the door to Jan Marie’s Flourishes. I hope you will move to the new blog with me and just to entice you to do so, I will tell you that the theme of my new blog has a sentiment stamp, ” The Sweetness of Friendship”, that I will give away to lots of subscribers and followers. So mark your calendars and join me next Tuesday for my journey as a blogger and a company owner as Flourishes and I move into the future and more growth. I will share more of the story over the next weeks and months. Please come along with me. It will be a new journey! 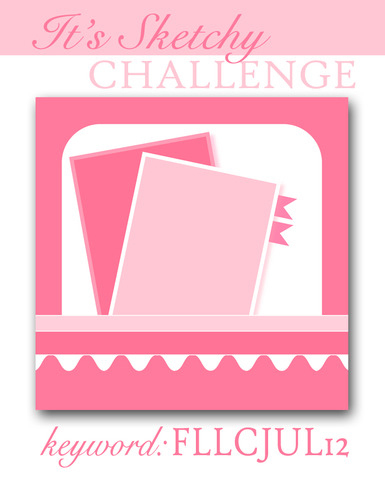 Today Flourishes has a sketch challenge. I think you will find it a fun one. Check the Flourishes blog for all the details and play along, won’t you? Here’s my take on the sketch. I was making a thank you card for a lady that went out of her way to be nice to me during my trip in Australia. You see, I got a burn, that was more that unpleasant. Edna ran out and purchased for me the most amazing ointment….PawPaw Treatment Ointment, within minutes the burning was under control. Thank you Edna. This PawPaw ointment is made from fermented fruit and appears to only be available in Australia. Believe me, I brought some home. For some time now I have been intrigued with using dramatic black backgrounds. Today is another one of my experiences. I cannot fib, I actually colored the image on white and cut it out an pasted it onto the black cardstock. I did try several attempts at doing the image on black, but all were too flat. I’ll keep you posted as my trials continue. The set I am using is With Gratitude which will go on sale next week during release. It was our FLIP gift this year and now goes on sale to the general public. I have used this set many times during this past year…definitely a “Go To” set in my book. 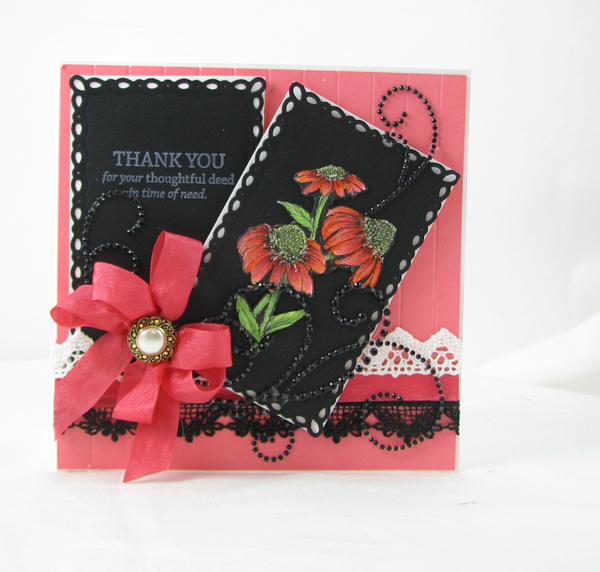 For my card I used Flourishes Classic white cardstock, as well as Black and coral. I used the Spellbinder dies, Romantic Rectangles, cutting two and then backing with white cardstock. I scored my coral cardstock using my ScorPal. Emblishments of black Zva Creative black crystals and 2 laces, one white Stephanoise Dentelle Cotton, and one black ,Laural Venise Lace finished off with color coordinated Hug Snug Seam binding and topped off with a button. The sentiment was stamped in White craft ink. HOW TO PLAY: Getting a chance to win Flourishes July Release is as simple as sketching it all out — that’s right — it’s a sketch challenge! Follow the layout in the graphic above and you’ll be in the running to win all four of our new releases for the month! Please remember, entries must be in by July 13th at 5PM EST to be eligible. If you upload to Splitcoaststampers, please use the key word FLLCJUL12. And, don’t forget to link up your creation right here on this post using the Inlinkz link widget below. Use Flourishes stamps if you have them — Flourishes entries will be counted twice! But, if you don’t have Flourishes, play along anyway, you could WIN some! Need some inspiration? The design team used this sketch and each put their own spin on this with vivid and beautiful creations! So, hop on over and see…. Flourishes is retiring some of our great images. What is on the shelves is all we have. Look HERE for a listing of the retiring ones that you really don’t want to be without. When they are gone–they’be gone forever! That’s it for me today and for””The Caruso Manner” blog. I hope to see you at my new blog , Jan Marie’s Flourishes. Don’t forget to subscribe or follow and get one of many of the Sweetness of Friendship sentiments stamps I will be giving away. 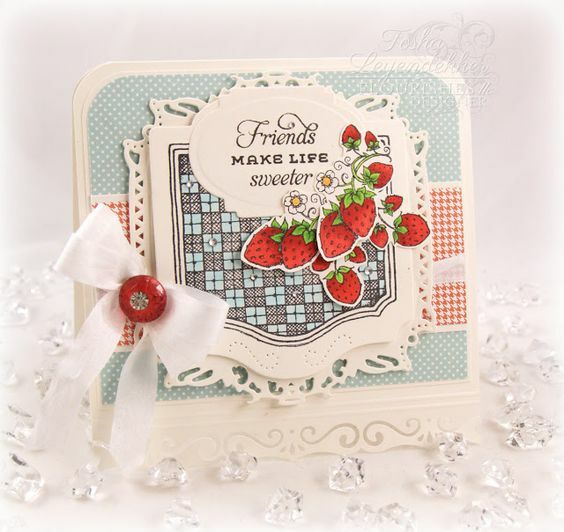 Today all of the Flourishes Senior Design Team will be sharing luscious card focused on a delightful sweet Strawberries that are in high season everywhere around here. I love this stamps set and every time I make a card with the set it pleased me. Today I went for a dramatic look. What do you think of it? I cut away most of the white around the image, then colored the background with my Copic Mulitliner and Black Copic 100. I then glued it down to black cardstock with Zip Dry Paper Glue. 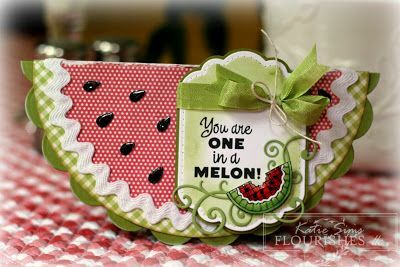 I cut into the shape using Spellbinder die Labels Twenty. An embossed layer of White Classic cardstock using Houndstooth folder from Couture creations. A tiny border of red cardstock and I was a happy lady. I used a wired ribbon from my stash and love the look. I know that seam binding is all the craze and ties nicely, but I love great ribbons! I will be busy packing today. I am flying to Brisbane, Australia, to be a part of the Scrapbook and Papercraft show ! I am a guest of X-Press Graph-X Supplies. This will be the formal opening of Flourishes to Australia. This will make our images widely available in Australia. The Scrapbook and Papercraft show will be held in Brisbane June 9-11. Stop by…I’d love to meet you! What fun! Thanks for stopping in to visit today. Leave a comment…I read each and every one. Today is the last day for our May release Sneak Peaks. We have another great set designed and penned by Marcella Hawley. This time we are focusing on summer living. Down here on the Florida’s Emerald Coast we move out doors. Neighbors have beautiful vignettes with rockers, ceiling fans slowly turning, even lamps to create the wonder feeling of out door comfort and living. At my house we eat all our meals out doors, why I even have special summer plates. I added those this year. My Mike, just loves living out doors. 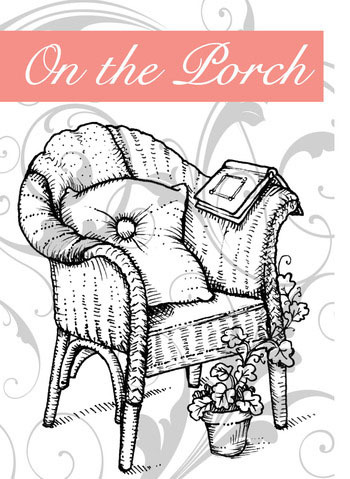 Marcella has captured the very essence of that feeling with the From The Porch set. I am sure you will fell the same way. Here is a sneak peak at the set. In my card I wanted to capture the feeling of living , or just visiting our lovely beaches. So many people travel to Florida for short vacations, snow birds” winter” here, many others own a condo/beach house and come often. So many of them say this is where there heart is and we tell them that once you get these sure white sands under foot, it never leaves your heart. So my card tries to capture that feeling. Embossing Folders: Couture Creations, Courtship, which I rubbed with ink. I reminds me of the waves a bit. Off now I’ll send you to the Flourishes Designers to see their creations. We have our last Mystery Blogger, so leave a love note! You also want to remember we have a Mystery blogger, so be sure to leave a love note at each stop you make during the hop. You may win a prize. Play in our Home Sweet Home Challenge for your chance to win the entire May Release! And all these sets are available for pre-order CLICK HERE! This FABULOUS Sale wraps up Sunday– May 13th– at midnight — so be sure to check out all the fun things that are on sale right now for 15% off — all embellishments, Spellbinders Dies and Folders, Embossing Folders, Tools and Paper! Wow! It’s a great stock up sale! We hope you’ve enjoyed sharing a bit of creativity with us this week! Be sure to tune back in tomorrow to see if your name is in …… THE WINNER’S CIRCLE! Thanks for stopping in I love your visits. The hour has struck and it is time for Flourishes Noon Challenge. This one is dedicated “for the boys”. I choose to use the stamp set, Watch a Catch, it was a no brainier. While he does not fly fish I truly thing he will get the message. 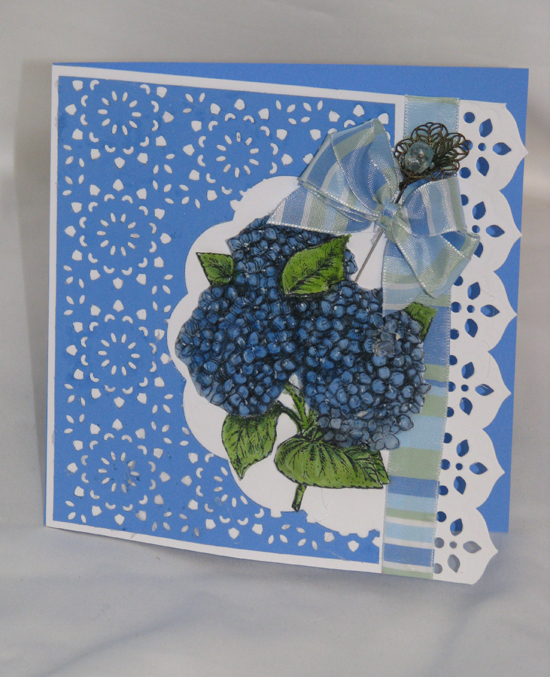 I used a mulit fold card in shades of blued. 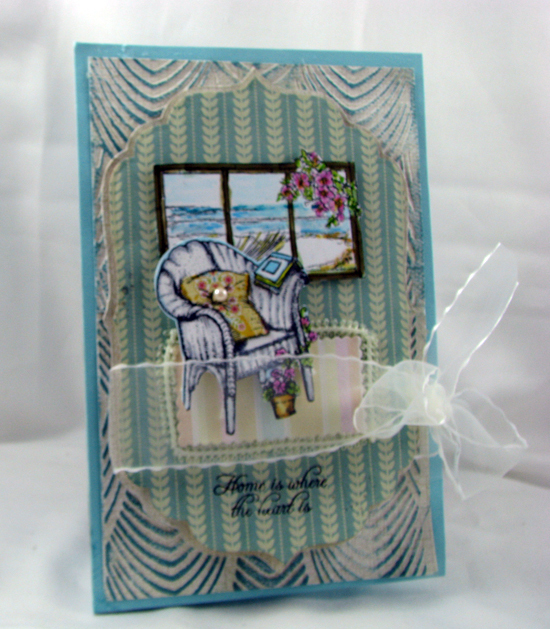 The focal image was stamped in Memnto Inks and colored with Copic Collections from the FLLC store. I stamped and colored in image twice so I could pop it up for dimension. I wanted that fish to look like it just jump off the card. 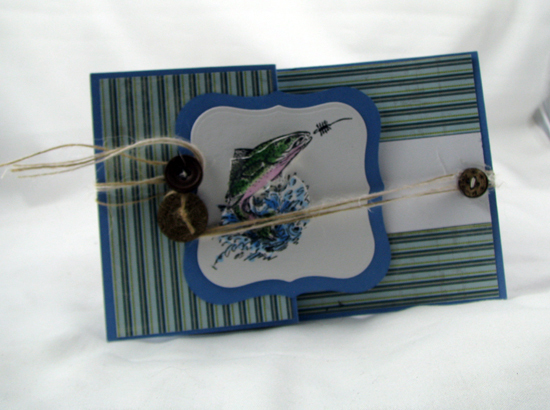 I used a Brocade Blue card stock from my stash to dress it up a bit I used the Authentique Loyal 6×6 paper pad. Used Spellbinder dies Label one in two sizes. fussy cut the image and really popped it up. 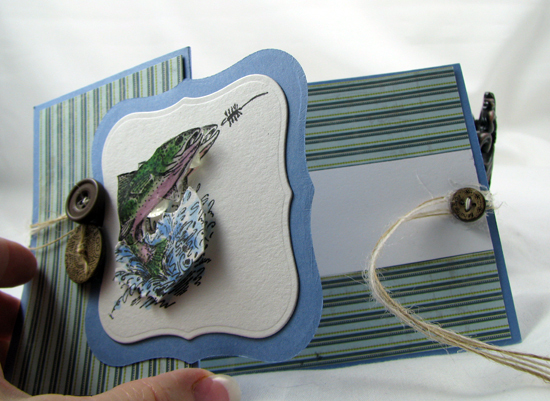 A couple of buttons from My Minds Eye Breeze Collection and some twine from my stash were all the special effects that the card seemed to need. I think he will be please with his card, don’t you. 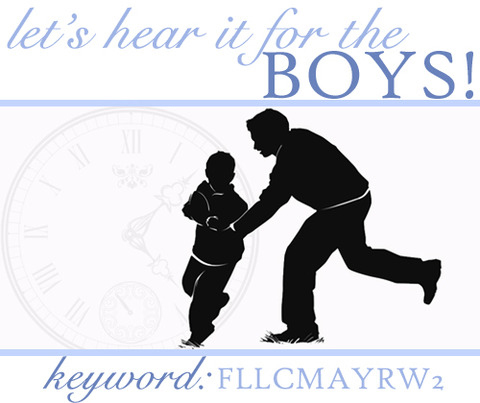 Now it is your turn, get busy and create your own card for “Let Hear It For The Boys” challenge. 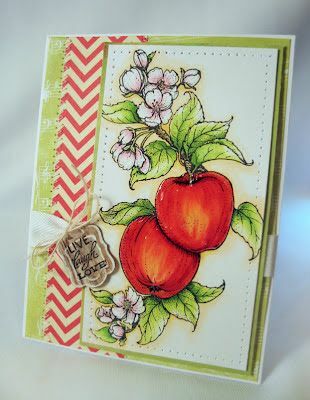 It is already day two for Flourishes newest stamp sets for May, 2012. 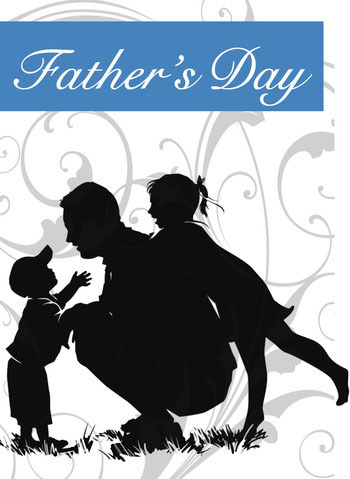 I am happy and proud to share with you a new set for the Fathers in our lives. This wonderful new set was penned by Lauren Pope. Yes, it is another of her fabulous silhouette sets. Lauren has a wonderful talent to make the art of silhouettes come alive. She is able to capture the feeling and emotions that elude other artists. Each one of her silhouette sets are always “wanta haves” if not “must haves” in our collections. This set is no exception. 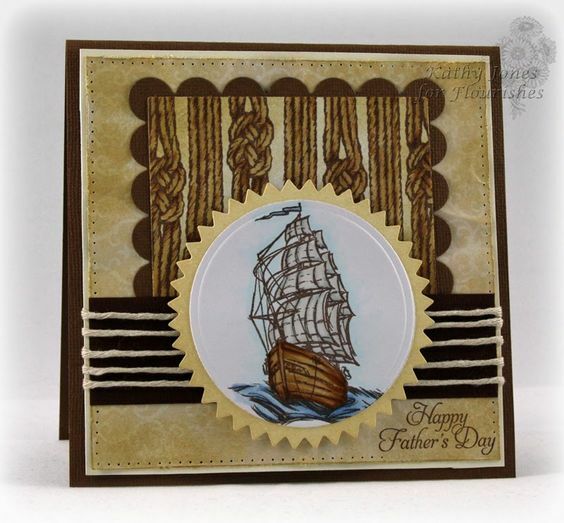 She has captured a Father’s love for his children in a captivating way–one that I think is unique to the world of stamping. OK, OK, I know you want to peek! Here is my card using this great set. My inspiration for this card is the fact that my nephew is a proud new father of a little girl. This image was perfect for him. I can only imagine the love and pride of a father with a new daughter. *NUNN DESIGNS RIBBON SLIDES- 6- ANTIQUE COPPER Yes, there are still a few of these wonderful slides available in the store in silver, copper, and gold! *Basic Grey Little Black Dress 6×6 Paper Pack– one of my favorites but sadly gone–and I don’t have much left either. I just loved these papers. *TAILOR-MADE CLASSIC BOOKPLATE TEMPLATE DIE –Back in stock! This is day two of our Spring Cleaning Sale ! at Flourishes. This sale is for these categories – embellishments, Spellbinders, Embossing folders, tools, and paper. How sweet is that! Get 15% off using the code SPRINGCLEAN at checkout! This sale will end on Sunday night at midnight, May 13, 2012 EST. A new CHA convention is coming up very soon and we want to make room for the products that we will purchase at the summer show. Visit the Flouishes Designers taking part in the hop today. I will be back for the NOON challenge so I hope you will come back again. Head to the Flourishes Blog at Noon Today for the Noon-Time Challenge and your chance to win this set! Flourishes is ushering in three new beautiful sets this month. Today we have a wonderful favorite that Marcella Hawley has penned. This beautiful set is filled with glorious detail. 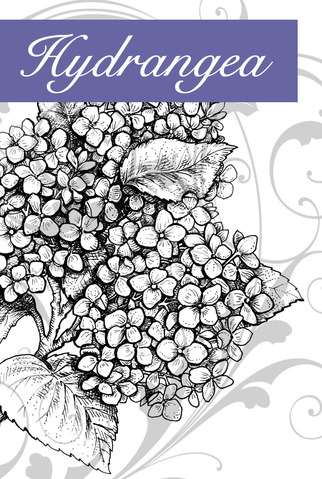 So I will share with you a peek at Hydrangea. This card was an experiment the entire way. I made two cards just in case I messed up, I would not have to start from scratch. To get a myrid of shades of blue I used my Copic Air compressor and so many shades of blue I cannot possibly post them here. I applied ink to a piece of FLLC Classic White card stock and a piece of vellum, spraying each color onto the two different layers of card stock. Then I stamped my image onto the paper with Memento black ink. I used my Copic blender to remove the color from the leaves, then colored them in using a new Copic collection group, Pistachio. It’s my new favorite green. 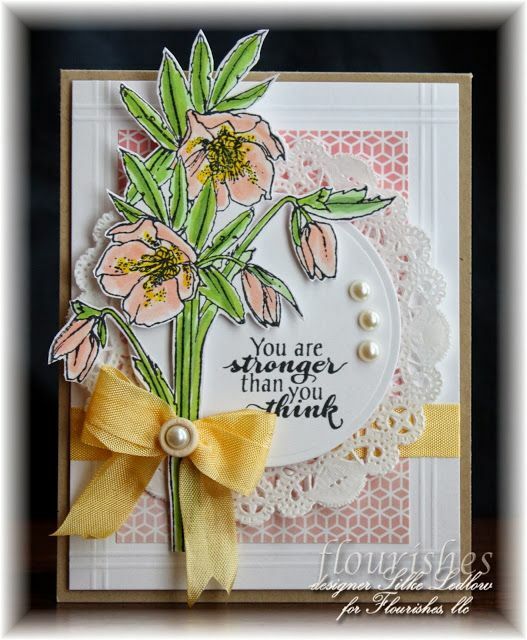 To brighten the card I applied dots to the flowers using a White Inkessential pen, to give them centers and definition. The images from both the card stock and vellum were “fussy cut”. I cut some additional flowers from the vellum and used small dimensional dots to give the image more depth. I used a piece of bright blue cardstock that I cut using the Grand Calibur scallop circle, punched the entire piece with a Martha Stewart All Over punch, Stained Glass Pattern. 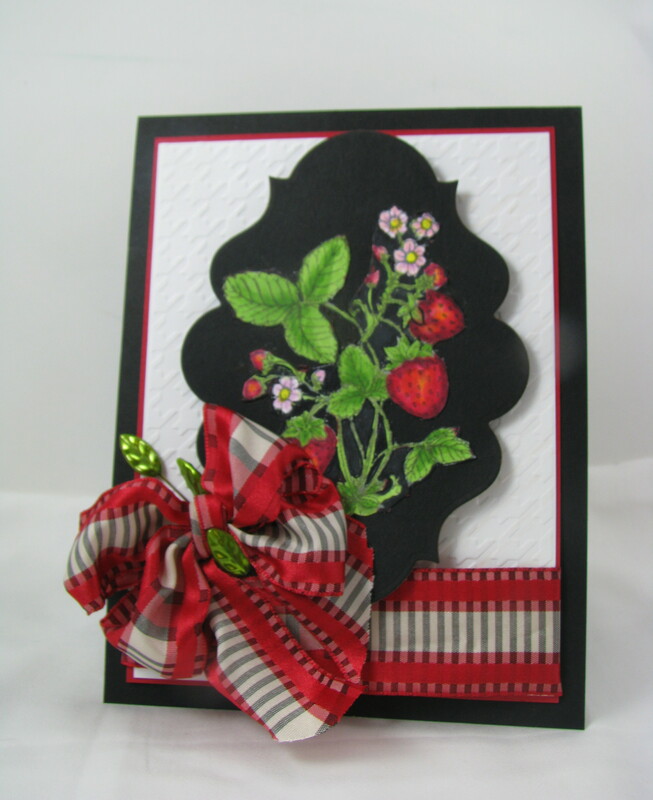 I edged the piece of white card stock with Spellbinder edgeabilities Classic Petal. I used the Edge Only and Insert A dies. A piece of ribbon bow and a jewelry finding into which I inserted a Clear stick pin that I colored with a blue Copic was the final touch. I have to say this was a fun process and I am happy with the results. Now you need to visit the Flourishes Senior Designers and see their wonderful creations. There is more good new. 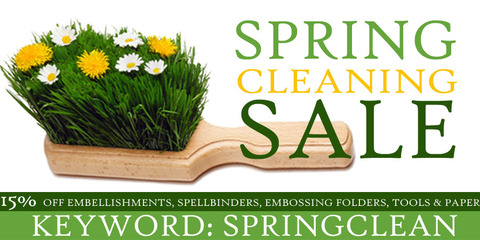 Flourishes is having a Spring Cleaning Sale! Embellishments, Spellbinders, Embossing Folders, Tools and Paper. Get a 15% off using the code SPRINGCLEAN at the time of checkout! This sale will end on Sunday night at midnight May13,2012 EST. New CHA is coming up very soom and we want to make room for the products that we will purchase at the summer show. You also want to remember we have a Mystery blogger, so be sure to leave a love note to have a chance at each stop you make during the hop. Head to the Flourishes Blog at Noon Today for the Noon-Time Challenge and your chance to win this set! Thank you for stopping in to visit.